Pumpkin powder is used to add flavor and nutrients to many dishes, such as pancakes. When mixed with water, it makes instant pumpkin puree for pies and other dishes. By making your own pumpkin powder, you can use your own fresh ingredients year round and save money while making tasty treats. 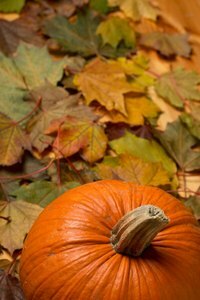 Use pumpkin that is in ideal harvesting condition for flavorful powder. Wash and dry the outside of a pumpkin. Use a large pumpkin or several smaller pumpkins if you want a larger batch of pumpkin powder. Cut the pumpkin in half and scoop out the seeds and set them aside. Cut out the stem and blossom end and cut the pumpkin into narrow pieces that are 2 inches long. Steam the pumpkin slices by setting them in a steaming tray over simmering water. Cook them with a lid on until they start to soften. Cool enough to handle. Set the slices on a dehydrator tray. Use a dehydrator appliance or a mesh screen -- such as a clean window screen -- or place the pumpkin on a cookie sheet the oven with the heat set at "low" or "warm." Dehydrate until the moisture has been removed. This takes several hours depending on the appliance you are using and how much pumpkin you have. Check the pumpkin periodically. Grind the dried pumpkin into a powder using a food processor, coffee grinder, or mortar and pestle. Store the powder in a jar or container with a tight seal and keep it in a cool dry location.